(Family Features) Orange pumpkins on doorsteps and orange candy corn in buckets are iconic staples of Halloween, but the season can be about more than fun and treats. 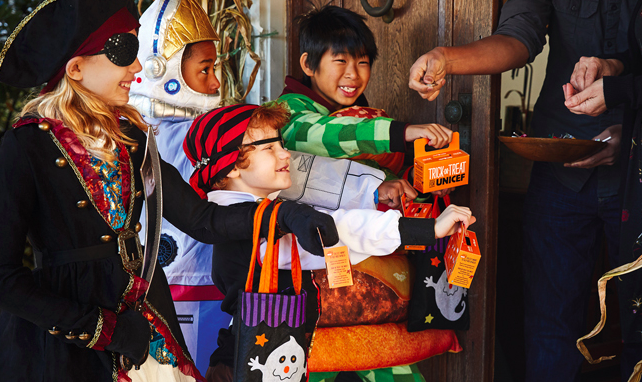 With nearly $177 million raised for health care, education, nutrition and more for children, Trick-or-Treat for UNICEF has evolved into a month-long celebration of the power of kids helping kids. Throughout October, kids, parents and teachers across the country can be “scary good” and add purpose to Halloween by supporting the organization’s work for children around the world. In fact, donations as small as 50 cents can contribute to lifesaving change. When kids participate, they can learn about global issues and feel empowered to make a difference. For parents and teachers, it’s a time-tested tool to help teach kids about the value of helping others and shape the next generation of global citizens. In addition, a series of partners and supporters are also making it easy to inspire change. This year, Key Club International, as a national partner, will continue to participate by raising funds for The Eliminate Project, which seeks to eliminate maternal and neonatal tetanus, a deadly disease that claims the lives of thousands of babies and mothers each year. A student-led service leadership program of Kiwanis International, Key Club is the oldest and largest service program for high school students. For more information, visit TheEliminateProject.org or KeyClub.org. Sony Pictures Entertainment will also support the campaign with “Goosebumps 2’s” very own Slappy hosting Trick-or-Treat for UNICEF’s daily treats calendar, available at TrickorTreatforUNICEF.org throughout the month of October. Start making big change and remind family and friends to pick up their own little orange boxes and share your Trick-or-Treat for UNICEF story on social media using the hashtags #BeScaryGood #TOT4UNICEF #KidsHelpingKids and tagging @UNICEFUSA. Visit TrickorTreatforUNICEF.org all month long for daily surprises as well as downloadable DIY donation boxes and additional resources.